Edging is the process of trimming the edges of the lawn to correspond with hard landscaping features. 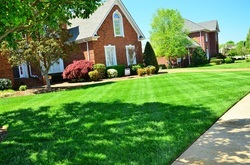 On lots of properties weed lawn edging is necessary maintain straight clean lines. Edging is a special service that we include in our regular lawn care maintenance program. Knoxville Landscaping Company is prepared to help you keep the edges of your landscape and lawn trimmed and tidy looking. Think of edges like frames of paintings. Not very substantial in their own right, perhaps, but very important to the overall effect of the artwork. Same goes for your house and landscaping. Edges are an important part of any landscape. Does your place of business have yard around it? Even a few patches of grass between the parking lot and the front doors? Consider a weekly or biweekly edging service to supplement your current maintenance program. A tidy well kept yard or front entrance to a business is essential and will give a good first impression of your business to your clients or customers. Knoxville Landscaping Company looks forward to hearing from you and designing the perfect plan to keep your grass mowed, your edging clean, and your property looking its very best.